Ox-tongue pastry (Chinese: 牛脷酥; Jyutping: ngau4 lei 6 sou1) or horse-ear pastry (Chinese: 马耳; pinyin: mǎěr) and may be referred to as a Chinese Doughnut is a Chinese cuisines that is popular in south China in the Canton or Fujian province. 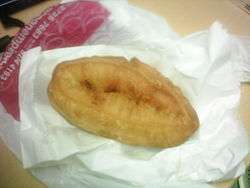 It is a fried dough food that is elliptical in shape and resembles an ox tongue or a horse ear. The pastry texture is chewy, with a soft interior and a crunchy crust. Ox-tongue pastry is lightly sweetened, and eaten as part of breakfast with soy milk. The pastry is made in a similar way as Youtiao, however, sugar is added to the flour. ↑ Johnny Law (2011-01-20). "簡單粥品又一餐". Retrieved 13 August 2012.